With this ticket you can utilize all subway lines for a day. This ticket does not last 24 hours. It is only usable on the day that it is activated. 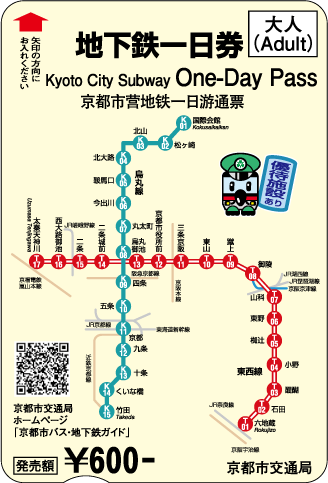 With this ticket you can ride any subway line as many times as you want for an entire day. This ticket comes with special perks and discounts. 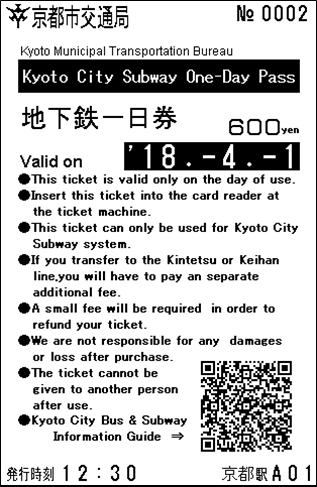 This ticket is reccomended if you plan on using more than 600 yen on the subway in 1 day (for children: 300 yen). Purchase in advance is possible. You do not have to use it on the day of purchase. The date will be printed on the back of the ticket the first time you put it through the ticket gate. Valid for the day of purchase. If you transfer to the Kintetsu or Keihan line, you will have to pay an seperate additional fee. 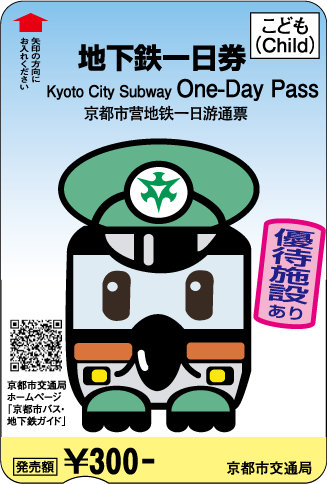 The ticket is only for Kyoto Subway lines. We are not responsible for any damages or loss after purchase. The ticket cannot be given to another person after use.